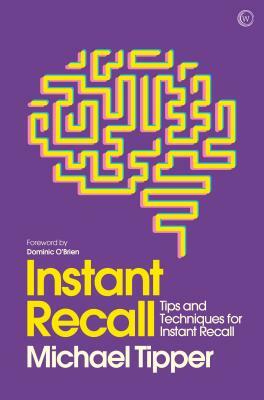 Never forget a name or occasion again with this guide to improving your powers of memorization that will make you a hit at home and at work. Foreword by Dominic O'Brien. Do you find names, events and facts reaching the tip of your tongue but going no further? Well help is at hand, memory master Michael Tipper guides you through his tried-and-tested techniques to boost your powers of memorization to astonishing new levels. Warm up by assessing your memory strength and the extent to which you can develop it. Stretch yourself a little more by practising shortcuts to retaining everyday information – such as route directions and simple lists. Work with techniques for remembering birthdays, putting names to faces and vice versa, and giving a word-perfect speech without notes. Finally, perform stunning feats of memory that will amaze yourself and your friends. Make forgetting a thing of the past. By following the wealth of easy techniques presented in Instant Recall your memory will soon be in tip- top condition, and you will find confidence and success.